​By Steve Gill - The day that dreams became reality. We travelled by train on the Friday in order to get to the expo early to collect our numbers. After a trip around buying the odd item and collecting our numbers back to the hotel we went. Saturday was spent walking around the Natural History Museum and meeting up with more friends before a trip to the pub for liquid refreshments and then out for an Italian meal with the group of runners and supporters (16 in total). The day began early with breakfast at 7.00am with a leave at 7.40am for the tube and train journey. With lee’s experience of the event it would be wise to leave early he said. Like true athletes Lee and I had a full English for breakfast. We met with Sharon and Dave at the station. The tubes were actually quite quiet and we had seats all the way changing twice enroute. Off the train it was a short walk (up a hill) to Greenwich park for the starting points . For those that don’t know there are three starts Red,Green and Blue). Dave and Lee were on the Green and Sharon and I were on the Blue. We wished each other well and went our separate ways. In the blue start we joined the toilet queue which to be fair was actually quite quick. We also met Allison before going to our start pens. You hear the start of the ladies elite race and the men’s elite but don’t see anything. Just over two minutes and we on our way over the start line for the main event. I had anticipated it being very hard to run given the amount of people doing it (40,000) but it was better than expected. I started with the 3.45 pacers. My plan was to do 3.45-4.00 hrs but in all honesty I just ran at a steady pace I could trying not to get carried away. London was always about the sights and experience and the first one was Cutty Sark. Around you went with just the thought of I have seen that on the TV. Onwards through the streets with the crowds sometimes three people deep, the noise was amazing. Next icon was Tower bridge, over you ran with me having the knowledge that my wife (Sue) and the WRR supporters were somewhere between 13-14 miles that was just afterwards I had to stay on the right side to see them. As I approached them I could see some excited faces and I managed to high five a number of them as I went by. You then headed off to Canary Wharf which was a large loop. I had a massive shout out from Jon and Sonia Edmonds from Telford Harriers at approx 17 miles which was appreciated as between 16-20 I struggled to keep myself on track with my legs starting to feel aches. During my training I had been using a no fuel plan but as I hadn’t gone over 20 miles took jelly beans just in case. At mile 20 I decided it was time for a refuel with beans. They are not the easiest of things to digest on the move but I knew they were required to keep me going. These with a swig of water to wash them down and soon gone. Now six miles as a normal run isn’t much but after 20 it’s a blooming long way. I kept talking to myself to keep it going and stick to the pace (I actually had no idea at this point what it was as had given up trying to work it out). At mile 22 you are on the opposite side of the road to where the WRR supporters are and they gave me a much needed cheer. Onwards I went to next see Jon and Sarah Aston who I managed to give high fives to and another moral boost received. At mile 23 it was just a parkrun to go, you can do it I told myself. As I ran down the road I was just zoned out into just finishing. This will explain why I missed the houses of parliament and big ben – oops. As you see the sign at the turn for the mail 385 yards to go there was a mixture of relief and happiness. I was glad it’s over to be honest but as I reached the finish line I was grinning from ear to ear. I went through to collect the medal and gave the lady a hug. Walking to get my goodie bag I met Dave and we went off to the meeting point (A pub where else). Lee was making up for lost time and was already on his fifth pint, I am not sure if he is faster at drinking or running. We were met by the supporters and other runners for a few drinks and catch up on our own experiences. A mention also to all of the supporters that cheered me on during the race, you were awesome. I crossed the line with a time of 3.37.46. Average pace of 8.16. Given that I actually wasn’t training with a set time purpose I am over the moon with the time. Just for you all to know rarely does anybody apart from the elite run the exact distance with the number of runners and I was no exception doing 26.34 miles. This race is a must do as a runner but I may surprise you now with the bomb shell that after waiting so long to do it I am actually no bothered about returning to it. Strange I know. So good luck to all that enter the ballot and thanks to Wrekin Road Runners for the opportunity to represent the club in THE Marathon. 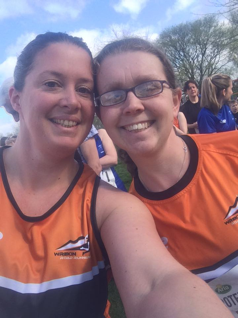 30th April 2017 saw Oswestry’s first half marathon event and it was a sell-out. 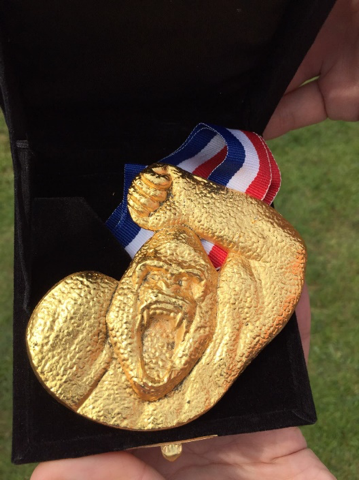 I had heard a lot of people wanted to get their hands on one of the medals which was based on the famous Spoon Gorilla produced by the British Ironworks. This was my second half marathon (the first being back in March). Not knowing Oswestry very well I didn’t know what the route would be like and even though the route was up on the website this still didn’t mean anything to me! The race was starting in the grounds of the British Ironworks Sculpture Park. Having arrived with plenty of time to spare, I got the opportunity to have a look round after collecting my race number. It’s well worth a visit even without the race to see all of the amazing life size animal sculptures and of course the world famous Spoon Gorilla. I didn’t get chance to visit the coffee shop and sample the ‘cake of the week’ even though the comfortable leather sofas were trying to lure me in, so purely for research purposes, I’ll re-visit. The event was very well organised, with plenty of parking, easy to pick up your race number, pre-race massage available from the number of Physios and of course lots of toilets for those numerous visits the nervous ones amongst us have to make! Of course there were the all-important refreshments available for the spectators and supporters of the runners (I’m told the bacon and sausage bap was nice!). So to the actual race….we ran the first half mile within the grounds of the sculpture park, down across a field and out on to the road. Along the route were different life-sized colourful animal sculptures marking the miles. At about mile 4, we started the loop of the town and surrounding area. The support along the way was brilliant, with lots of people cheering us on in the town and lots of the locals coming out of their houses to cheer us on and encourage us with sweets. The description of the route on the website had said ‘we have a fantastic hill to test you between mile 6 and 7’. Now anyone who knows me knows how much I dislike hills (although I am beginning to accept that they are part and parcel of a good route), so I had mentally prepared myself for it. However, I can honestly say it wasn’t that bad at all. Listening to the advice of others from the club prior to this race and knowing that this was the only ‘real’ hill meant that I coped with it perfectly well and dare I say it but enjoyed it. ​Apart from the first and last km, the route was on the road. Road closures were in place and the route was well signposted with plenty of marshals, all cheering you on and shouting encouragement. The remainder of the course after this and back to the finish was a gradual decline and at about mile 9 you re-joined the route you had run earlier, all the way back to the finish, heading back into the sculpture park for the final half mile. Once you had crossed the finish line you joined the queue firstly for your t-shirt, then for your goody bag and then for your medal. This would be where I would suggest an improvement, the queue to collect your medal was very long as each person was going up on to the presentation area individually and having their photo taken with the mayor who was handing out the medals. All in all, it was a very good event, well organised, good route, great medal, and the support from everyone was brilliant. Definitely a race I would recommend. Not to detract from today's 'other' race, but today I Stormed the Castle. Well, I say stormed, crawled or crept in would be more accurate. 10k run, 33k bike, 5k run. But don't let those distances fool you, the runs wouldn't have been out of place in the Summer Fell Series! A 5k loop done twice for the 10k, taking in the Lactic Ladder, twice, and a climb to the castle, twice! The Lactic Ladder would put the Woodbridge steps to shame! It resembled the steps in the Race the Train 10k race, but longer, MUCH longer! And twice! Then onto the bike ride. That's easy you might think. And you'd be right, until you hit the hill at mile 6. It's not very often it takes over 7 minutes to go 1 mile on a bike. And mile 7 wasn't much easier, taking over 6 minutes. But that was nothing with what was to come at mile 18; a whole 9 minutes and 39 seconds of sheer power and exhaustion! Many a rider had to dismount, but thanks to my very low gearing I was able to get up it, just! And then compare that to miles 19 and 20 which took 2 minutes 24 seconds and 2 minutes 9 seconds respectively - a most welcome downhill end to the ride. If you weren't finished by this point then the last 5k run would do it. My right side glutes were screaming blue murder, my feet barely left the ground as I shuffled along. This 5k was very slightly different to the first 5k loop in that we missed out a road section. But what that meant was it was almost all the off-road section, and the dreaded Lactic Ladder, again, twice, again! And then the final finish up the hill and into the castle grounds. Now as a comparison, a normal road 10k would take me a fraction under an hour, a 5k half an hour, and an ordinary 33k bike ride about 1 hour 15 mins; that's a total of about 2hrs 45 mins. Official results don't seem to be out yet, but by my watch it took approx 3 hrs 35 mins! It's not for the faint-hearted, you need to be a highly conditioned athlete (like me), and someone with a strict training plan (again, like me). Fabulous event, very well organised, albeit an 8am start, registration ends at 7:15am, needed to be up at 5am to get up, get ready, and get to Ludlow in time. The support around the castle was huge and fantastic; they must have taken lessons from our own Jennifer Harrower. Great medal and tech t-shirt. Would I do it again next year? Maybe. ​Donna had said she was doing this race so I thought I would sign up and tag along, use it as part of my London training and see where I was at. We arrived at the Blythe valley park with nearly an hour to spare so had a wander down to the start area and first visit to the loos. Time went by quickly as we got race prepared and then headed to the toilet for another visit. With 25 minutes to go you would think no problem. As we queued the queue moved slowly, very slowly. With 7 minutes to the start a young man in a high viz told us to make our way to the start as apparently the race won’t start until we are all here. Yes of course it won’t mate, lol. The queue totally ignored him and we held firm in our positions. The queue went down and we made the start with 120 seconds to spare. Starting in a business park, we headed out on to the roads around the local area. I have to say the organisers had done a fab job with the traffic having traffic lights at all junctions (all on red so the runners could keep going). I am not sure the people sat in the traffic queue would feel the same though. With them holding up the traffic it actually felt like a closed road race with the occasional car coming the opposite direction and from behind. My plan for what is was worth was to stick to 8 min mile pace for a 1.45 finish. Please don’t ask me to pace you in a race as I cannot pace myself and after the first two miles was at 7.20 min. My usual strategy of slowly picking people worked as I continued at the same pace. One by one the miles were ticked off until the relief of the 12 mile marker was in sight. Only 1 and a bit to go. As we headed back down the same road we went out for the last three quarters of a mile I knew finally were the finish was. Upping the effort in the hope of catching another runner. Down to the roundabout and just the other side was the finish, oh frigging no it isn’t as they signalled for you to turn left and go up the road and around a building and back. Not only was that finish mentally hard it was definitely physically because I like all the others were already done. I managed to just catch another runner just before the line (yes THE RACE FACE was out). Thankfully it was worth it as it propelled me to a top 60 finish in the race (Entry of 730 runners). Over the line and the garmin says 13.3 – what? Not sure why we had the turn left! A final finish time of 1.36.28 for me at 07.15 min pace – oops. Donna got a good time of 1.59.46 although wasn’t happy with it. She sets some high standards does the lady. Worth a trip to take part. ​I decided back in June 2016 that I would like to do an overseas race. That was actually not long after my first 10k. Back in June, April 2017 sounded like plenty long enough to prepare for 13.1 miles, but in the event, it was actually my fourth half marathon. Berlin appealed to me for a number of reasons; it's my favourite city, I know my way around, haven't been for a couple of years so would like to go back, I speak the language, and the course is flat. My parents had never been to Berlin and so were on board for being support crew along with Mark, and we decided to make it a family holiday and stay for a week. Arriving on the Thursday, we settled in to our apartment which I had selected to be within walking distance of the race start & finish. My parents were staying in a hotel very close to the start/finish line, just 15 minutes or so away. This was the first time I'd done a race big enough to have an expo, and so to me this was an exciting part of the race experience. We had been warned that the expo would be very busy on Saturday so got there as it opened on Friday. The closer we got, the more people I spotted wearing running shoes (as I was myself, due to travelling light and wanting to keep my feet race-ready and comfortable despite the sightseeing). Race number pick-up was straightforward, and we were given a clear plastic bag to be used if required on the day, along with a race magazine and other bits and bobs. A wrist band was attached to our wrist which would act as admission to the start pens on race day. There were lots of stalls selling all manner of fitness and running related paraphernalia, plus race t-shirts and sports massage facilities. Friday and Saturday were spent eating and sightseeing. On the Friday I clocked up 25,000 steps and despite trying not to do much on the Saturday, I still got to 15,000, mainly because we went to see Tempelhof airport which has impressive 1930s architecture. It is now Europe's largest park and really is vast. We also visited my favourite cafe, above the chocolate shop Fassbender & Rausch which does an amazing variety of hot chocolates, and fabulous desserts. The night before the race there was a pasta party at the hotel my parents were staying in, so we went along to that. Race day dawned fine, with forecasts of 15 degrees; a little warm for my liking but better than rain. As we walked to the race start we saw a few in-line skaters and hand cyclists - I was sorry not to be able to see these categories race as they started before the masses, but after I was in my start pen. As usual there were queues for the portaloos (which were not the nicest ones I've seen at a race, I'll spare the details) and a lot of time was then spent waiting in the start pens. At least it was warm, from the penguin-huddle effect of so many bodies in close proximity! There were plenty of loudspeakers so you could hear the commentary from the start area, mostly in German but with the odd update in English. We were told that there were just over 34,000 runners, from 106 countries. Our bib numbers did not show nationality but I heard a few languages being spoken in the start area. It was around 35 minutes after the mass start siren sounded that I finally crossed the line, heading past the Alexanderplatz TV tower (tallest building in Germany which also has a revolving restaurant and viewing platform affording great views of the city) and down towards the Brandenburg gate where Mark and my parents were waiting at around the 2km point. From there we passed the Siegersäule/Victory Column, glinting gold in the sunshine, and headed westwards out of the city centre towards Charlottenburg palace. It was incredibly busy and I knew I was doing a fair amount of weaving across the route, rarely following the blue painted lines on the road, but the sheer density of runners made it necessary. I was trying to maintain a pace of 6.20-6.25 per km. I reached the first water station with an average of just under 6.20, but by the time I exited the water station my averagepace had slipped to 6.27. The water stations were complete carnage, mainly due to the fact that they were giving out cups of water, not bottles (plus tea. Tea?? Apparently it was not sweet iced tea, but warm and tasted bitter like Lemsip, according to a group of girls from Northern Ireland I met). This resulted in having to stop, wait for a cup, drink, then run through hundreds and thousands of crunchy plastic cups. Not good. If anyone reading this ever runs in Berlin, take your own bottle and refill it at the later stations. I managed to get my pace back on track and concentrated on dodging people and appreciating the surroundings. Unfortunately it was warm so I did need to stop for a drink at all four of the water stations. My pace started slipping after 15km, despite my concentrating on the excitement of passing through historic Checkpoint Charlie and Potsdamer Platz in an attempt to ignore my pain. I was focused on getting a PB and knew that when my watch said 21.1 km it would not be the finish as I had not stuck to the shortest route as marked on the road due to the volume of people. I couldn't believe that it was so busy all the way round the course. I was also surprised to see so few people in fancy dress. The only people in costume I saw were two Minions....and yes, they overtook me despite the sunshine and their giant round yellow squidgy bodies. Finally I rounded the final corner and saw the finish gantry. I pushed as hard as I could (it probably looked just like a shuffle) and crossed the line in 2:17:55, a PB by 33 seconds, my watch showing 21.42 km. I struggled not to be sick and was ushered aside until the feeling had passed, though then having to walk past the mountain of bananas (I really don't like them) did not help me feel any better. After being given my medal, I declined the free alcohol-free beer, opting for water that although still in a cup, I could at least take my time to drink. Before leaving the finish area you could collect a (free) provisional certificate and get your time engraved on the back of your medal. I had pre-paid for the latter but the process of collecting the medals after engraving was somewhat chaotic so I had time to buy a pancake and to take in the atmosphere whilst enjoying the food. Having retrieved my medal I rejoined my family in their hotel cafe around the corner for some more refreshments. We then spent a further few days exploring the city and enjoying the local food & drink. Berlin is an easy place to visit and I would highly recommend this race to anyone wanting to do a half marathon abroad. Just take your own water bottle! This was the first time I was competing in a trail race and only the second time of running this distance competitively. For a change I wasn't nervous. Normally I have a terrible morning leading up to races. This felt good, the sun was shinning my spirits were high. On arrival at the car park I saw Elaine and Rob Hurley, it was nice to see some familiar faces, I thought I was on my own today. I went and collected my number had a quick warm up round the field, by now they were calling runners to the start line. This was when I started with Laura Mackinnon she took a starting line photo and then we were off. We ran round the playing field and out of the school grounds down and out of the village, this didn’t feel as fast as Strava had recorded but hey I was going down. We entered the trail part of the race running round farmers fields. It started ok, the ground was firm and surprisingly dry. As we ran round these never ending fields, the gateways were muddy but nothing compared to cross country so I was feeling good. Through these fields was the odd bridge going over little streams which I would normally be running in so it was unusual to be dry at the other side. On I went, we were then advised to be careful going over the stile, there was 3 of these I think! After this there was an incline out of the field and back onto tarmac this was where the water station was at 6km. The water was very welcome as the sun was quite warm. We were soon directed back into a field with the help of Jennifer Anniston (cardboard cut out attached to hedgerow). At 7km we arrived back on school grounds. We then followed narrow roads round the back of the monument this was also a very welcome downhill. Soon a man directed me up a very narrow single file trail, I began to believe this was the start of the big climb only to find that the next section was the climb. I managed to run all the way up. I was so glad to see Jon and Sarah Aston at the top they were a very welcome surprise. Then a man I've seen at several other races started cheering me on while taking my picture. On the way back down Stacey Leigh Paskin was walking down with bob dog. I don’t normally like downhill but this section was a welcome breather after the climb up. On approaching the church I heard the infamous cow bell and the much needed cheer from Jennifer Harrower. By this time I had just passed 9km, thought I'd ran a lot further than that. Round the last field past the tennis courts then back onto the school field. At this point my husband and children greeted me with a massive cheer this pushed me round the school field and through the finish line. I was now rather surprised with my time having run Wheaton Aston 10km in 1hr11mins10sec, I completed what I believe to be a tougher race in 1.12.30. I thoroughly enjoyed this race and I owe that to taking part in the cross country series, which I have to thank the club for advising us to take part in. I would definitely consider doing this race again.